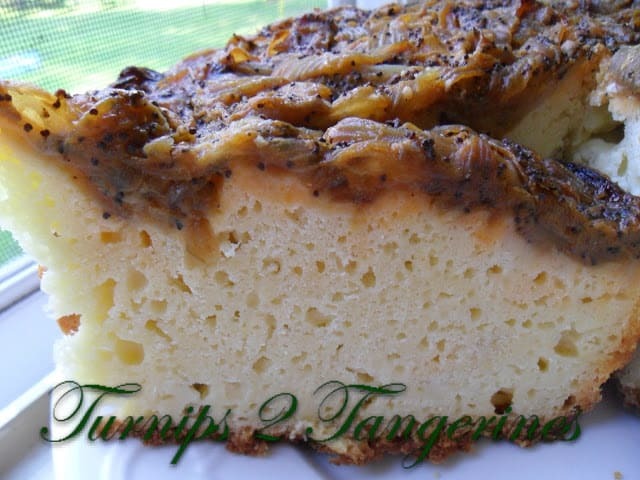 This rich, moist savory cake has an onion-poppy seed topping but that’s just the beginning. It’s a dense cake made with white flour, eggs, butter, milk and sour cream. The perfect accompaniment to any breakfast, lunch or dinner. It’s a wonderful change from regular bread served with a meal. You can serve this bread as a side with meat, stews, soup, chili or top slices with cheese. Amish Onion Cake/Bread makes a fantastic grilled cheese sandwich. We have wanted to try this cake/bread for a long time. I found this recipe in a Taste of Home Cookbook called: “The Market Fresh Cookbook.” One of many in my vast collection of Taste of Home Cookbooks. I bought this cookbook over 6 years ago and thought it was high time to give this recipe a try. I’m so glad I did! This bread is wonderful. Rich, hearty, different and tasty. A nice change of pace from dinner rolls or corn bread often served with Thanksgiving dinner. 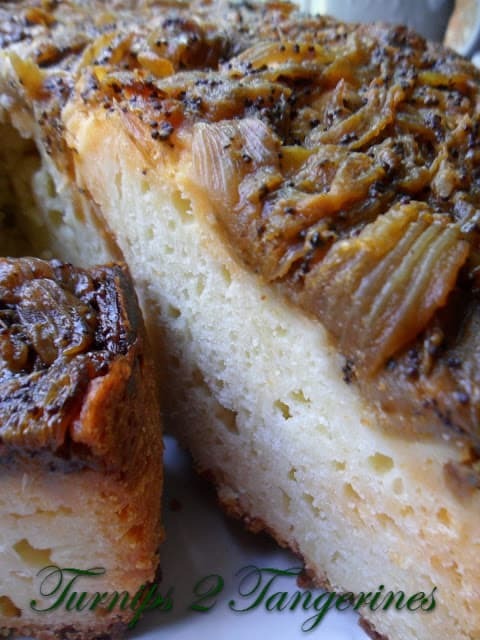 Amish Onion Cake/Bread is rich and delicious! 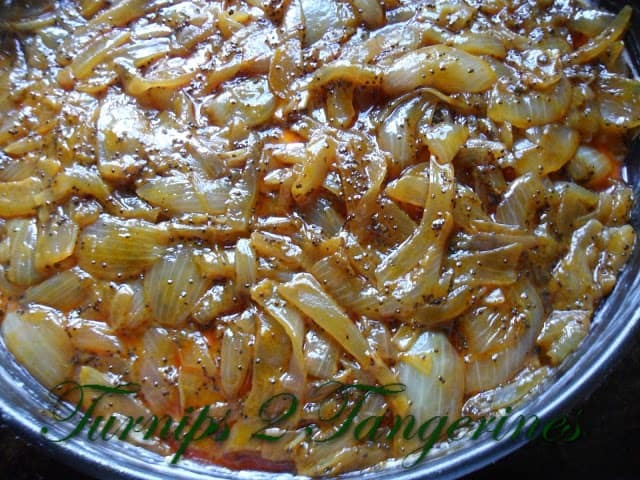 In a large skillet, cook onions in 1/2 cup butter over low heat for 10 minutes. Stir in the poppy seeds, salt, paprika and pepper; cook until golden brown, stirring occasionally. Remove from heat; set aside. In a large bowl, combine flour, cornstarch, baking powder and sugars. Cut in 1-1/4 cups butter until mixture resembles coarse crumbs. Melt the remaining butter. In a bowl, whisk the eggs, milk, sour cream and melted butter. Make a well in the dry ingredients; stir in egg mixture just until moistened. Spread into a greased 10 inch springform pan. Spoon onion mixture over the dough. Place pan on baking sheet. Bake at 350 º for 35 to 45 minutes or until toothpick inserted near the center comes out clean. Serve warm. Yield: 10-12 servings. For dessert serve warm slices of Apple Kuchen with a whipped cream cheese topping or with my favorite, cinnamon ice cream. Six years is a long time to wait! My mom loves those onion rolls you can find in grocery stores. She would love this bread! Thanks for sharing this week, Lynn. Hi Lynn, this cake bread look nice, I like the soft texture. Something different from the usual bread. Regards. What an interesting recipe! I have never seen a bread like this before–will have to try it out sometime! This looks so good! 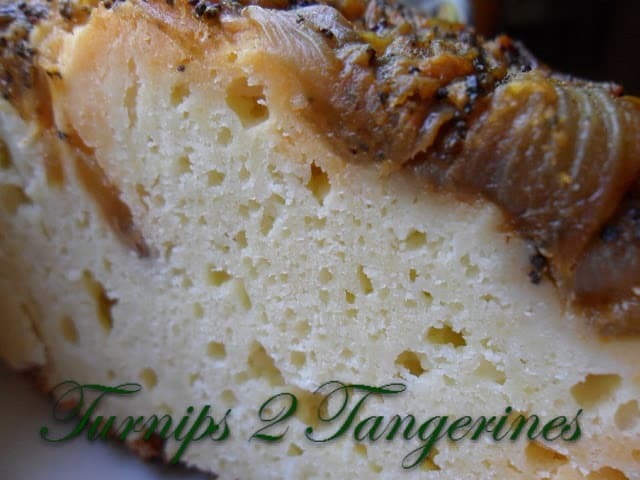 I love savory cakes and breads, especially to go with soups or salads, or alongside some meat. This sounds wonderful! You had me at onion and poppy seed! Looks yummy!